Extreme sports aficionados will soon have an official GoPro answer for capturing 360-degree spherical video and still images of their adventures, as the action cam company has finally taken the covers off of its new "Omni" rig. Omni appears to be GoPro's in-house answer to the burgeoning virtual reality recording market, which it first entered in a tie-up with Google last year. 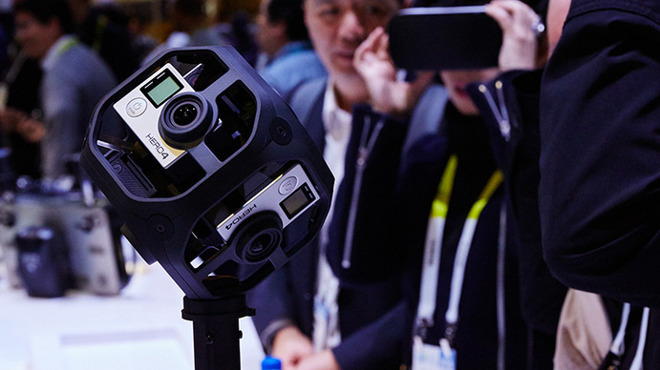 GoPro's version uses six of the company's Hero4 Black cameras in a custom cube-like housing. GoPro says that it has developed special technology that allows for "pixel-level synchronization" between all six cameras. The company has yet to explain that technology in more detail, but it's likely designed to reduce the amount of post-processing required to get a usable spherical video. Pricing has yet to be announced, but the Omni will almost assuredly come in at a lower cost than the $15,000 Odyssey unit that's designed to work with Google's Jump platform. The Odyssey uses 16 Hero4 Black cameras. GoPro will show off the new Omni unit at this month's NAB show in Las Vegas, where pricing and availability will likely be confirmed.